OK, you don’t wanna drill holes to install your security cameras, since you don’t want to ruin your house’s perfect décor or brand-new siding. Or you are renting an apartment, your landlord would not allow you to install the security cameras with screws. Guess what? You can install your security cameras without drilling holes at all! You can get a step-by-step guide to install your security cameras to the wall, brick or eave even without screws. Here we list the main components you’ll need to install your security cameras to the wall without drilling holes. Now You can check the below detailed steps to mount your outdoor or indoor security cameras without drilling. In order to show you the detailed steps to mount security cameras without screws, here we’ll take an RLC-410 PoE security camera as an example to share our detailed installation process. Step 1. Use a measurement tape to measure the distance between your camera and your router. Plan the shortest wiring route, and then you can determine the length of your Ethernet extension cables. Allow a few feet of extra wire of both terminations for future reorganization if needed. Step 2. Turn of the power before your installation job in order to protect your personal safety and avoid damaging the camera. Step 3. Use the adhesive strip or 3M industrial tape to mount the camera to the brick, or the vinyl siding without drilling holes. Step 4. Fish the Ethernet cable from the camera to your router. During the wiring, you can run the wire behind the baseboard in your room so that you can hide the security camera wires. For more details, you can get a A-Z guide on how to run security camera wires here. You’ll get extremely detailed guides, including how to hide security cameras outside/inside, how to run power cables to security cameras, etc. Step 5. Download and launch Reolink App on your iPhone or Android smartphones. 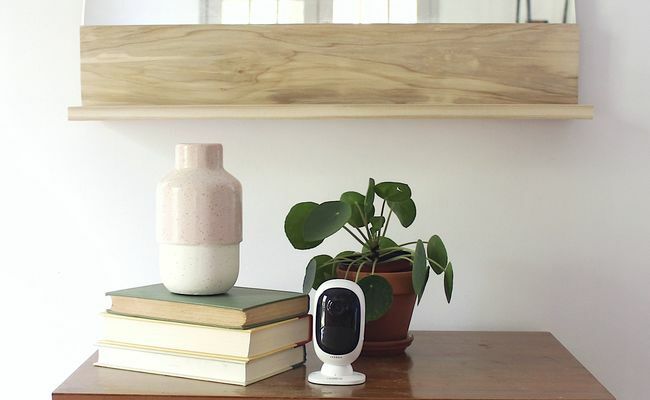 When your security camera and your mobile phone are connected to the same router, the camera will be automatically added to the app, and you can get live streaming at once. You can check the below video to see the detailed steps to connect a PoE security camera to the router. If you don’t need to mount your security cameras to the wall or brick, you can try to place your CCTV cameras in strategic positions. This solution would work best when you need to put up a security camera without drilling holes inside your apartment. For example, you can place a security camera on the shelf standing at the corner of your room. Make sure your security camera is close to the power outlet and can connect to your router. We have a small table inside our living room. And we place this little camera on our table (glad that it doesn’t need wires to get power). And we made a video to show you how we moved this cute camera when we wanna monitor other points of our home. 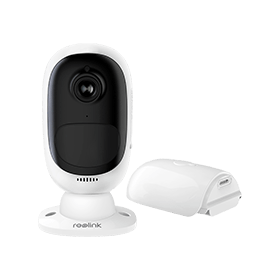 You can try security cameras without installation like the camera we are using now. So you don’t need to worry about the drilling issues at all! If you have any questions on installing security cameras without drilling holes, or have any DIY projects you wanna share with us, please leave them in the comment! This entry was posted in Buyer's Guide and tagged easy to setup, no drilling holes, security camera installation. So you still have to fish a wire so you still have to drill a hole. WOW!!!!! to the author.